Modern life can sometimes feel like running on a treadmill until you get a chance to gasp for breath, but a little quality time in the lap of the serene Himalayas can help you rediscover inner peace. This was the choice I made; trading my laptop for a backpack, I boarded a flight to a place where your shadow is your only companion: Ladakh, India. My travel buddy, Jane, and I took a flight from San Francisco to Delhi and then to Ladakh in the month of August. 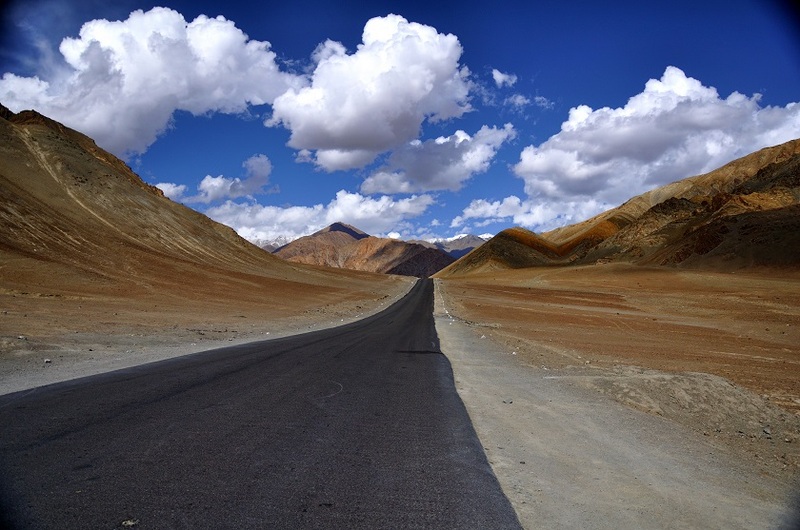 Once there, we realized that this was indeed the best time to visit Leh Ladakh. 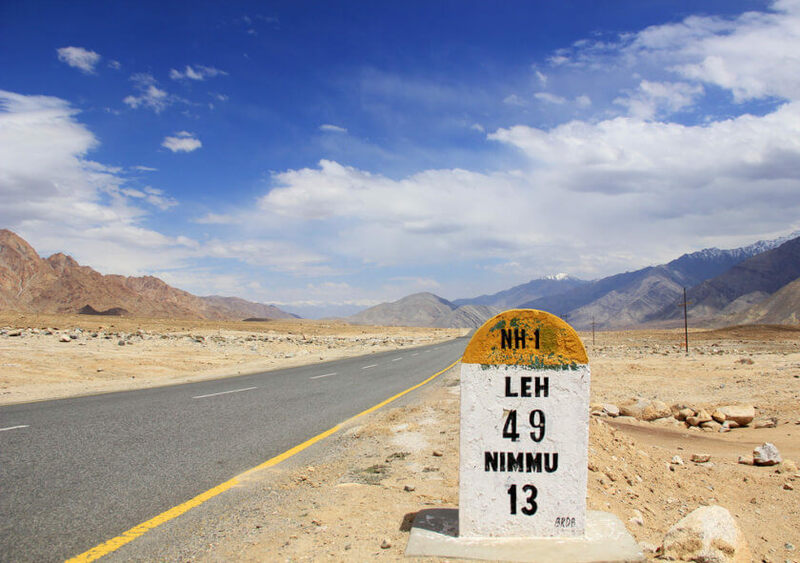 The roads from the rest of India to this beautiful region remain open, and you’ll be greeted by a pleasant chill and occasional snowfall on arrival at Kushok Bakula Rimpoche Airport in Leh. 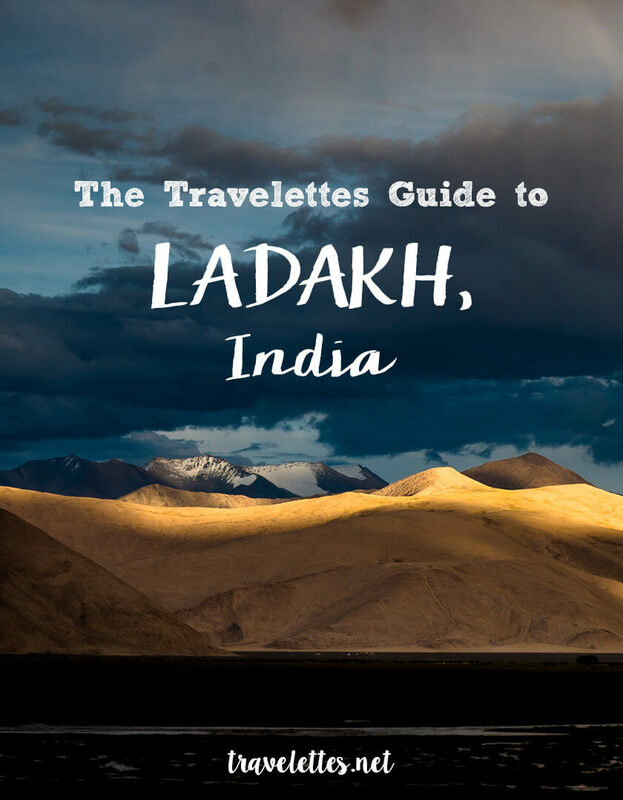 India typically has a tropical climate and summers exude scorching heat, but Ladakh’s Himalayan landscape makes the weather generally cold throughout the year, and one of the best places to visit in summer. Carry heavy woollen clothes whenever you visit Ladakh. It is very much unlike what you hear about India from friends and family. The main reason we chose Leh Ladakh over other summer destinations in India was the Tibetan influence. Ladakh has been under Tibetan rule since eighth century A.D, resulting in strong Buddhist influences on religion, art, architecture and food. Waking up to a Tibetan breakfast and a cup of hot butter tea in the hotel before setting out to seek truth like an Arihant was an unforgettable experience! The Tibetan influence is also responsible for the many beautiful monasteries to visit; Tibetan Buddhism has different schools and sects, and each monastery belongs to one of these sects and is unique in its own way. One of the major monasteries is the Namgyal Tsemo Gompa. Built in 1430 by the Ladakh King Tashi Namgyal, the Gompa houses a three-storey statue of the Maitreya Buddha and allows volunteers to engage in the daily chores of the monks. 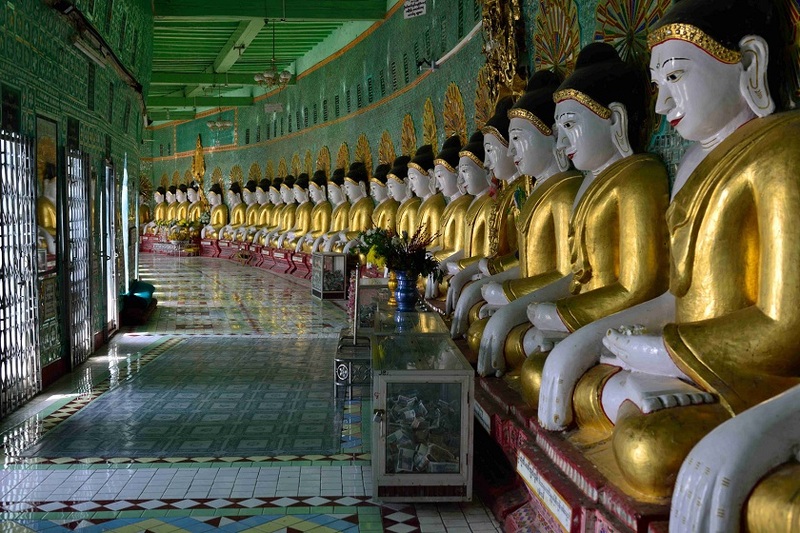 The calmness radiated by the monks is almost palpable, and you can spend some quality time here, soaking up the serenity. You can also motor your way to the Hemis Monastery, host of the annual Hemis festival in the month of July. Dedicated to the Guru Padmasambhava (regarded as the Buddha incarnate) the monastery is famous for the masked parade during the festival. Reserve the evening for a leisurely stroll to the Shanti Stupa to view the sunset before retiring to your hotel to guzzle and gorge on hot Tibetan Thukpas and savor the purity of both the physical and the metaphysical. I really liked the taste of hot Tibetan food – so much that I ended up chatting an hour with the hotel chef, learning about some popular recipes in Tibetan cuisine. Set a date with the blue blood of Ladakh! The Leh Palace, built by King Sengge Namgyal in the sixteenth century, stands tall as an epitome of endurance in the perenially cold climate of Ladakh. 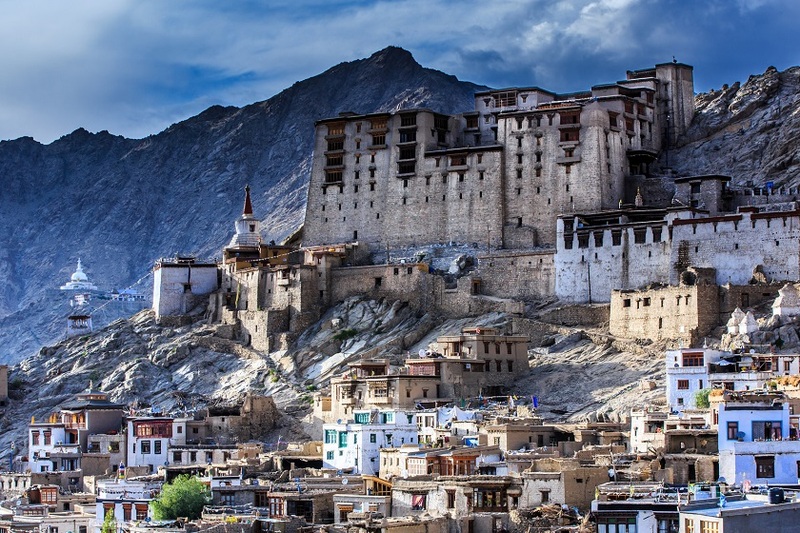 Replicating the Potala Palace in Lhasa, Tibet, the Leh Palace took us back in time to give an insight into the permeation of Tibetan influence in the subcontinent. The gargantuan architecture and sand-colored masonry complement the arid, dry and ice-cold landscape of Ladakh; architecture styles in the region are engineered to brave the extremely harsh winters, keeping the interiors warm enough for human habitation. Up next on our itinerary was the Stok Palace. Built by the Ladakh royal family after the Dogra army invaded Leh Ladakh, the Stok Palace to this day houses the members of the royal family and dynastic treasures of art work. 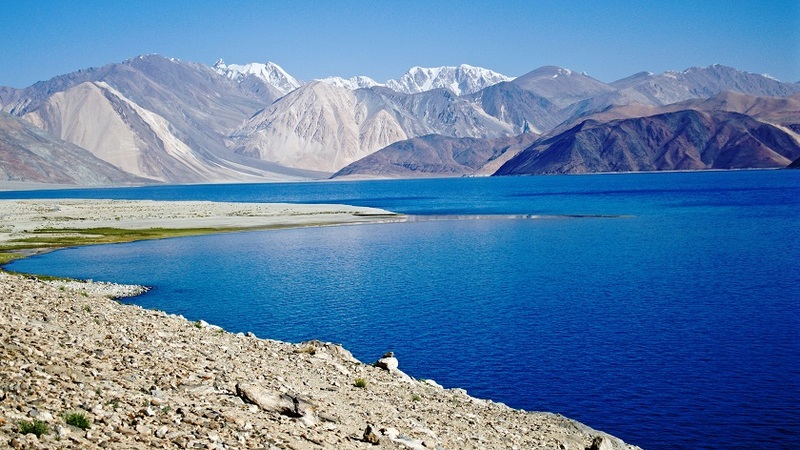 Reserve a day for a visit to the Pangong Tso Lake. The 220 km drive around the Changla Pass snakes through a typically arid, dry and rocky terrain that offers plenty of photo opportunities – don’t forget your camera, especially if you are a budding photographer! 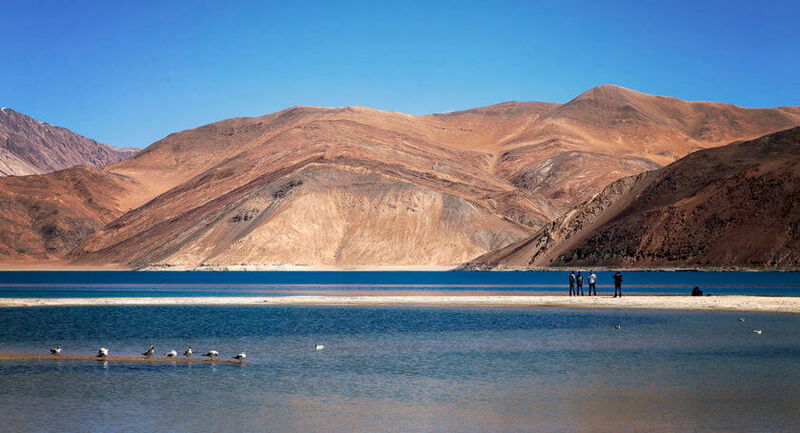 The view at the Pangong Tso lake is a feast for the eyes, and one can sit by the lake to absorb precious moments of pin-drop silence that are only punctuated by the lone far-reaching voices of other tourists. We kept observing the waters of the semi-frozen lake that kept changing color over the course of two to three hours. Give yourself a minute, breathe the fresh air and take in the staggering landscape. 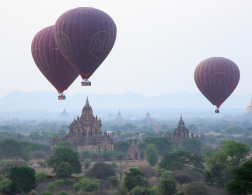 Then, head back to the hotel, camera in hand – loaded with breathtaking snaps. 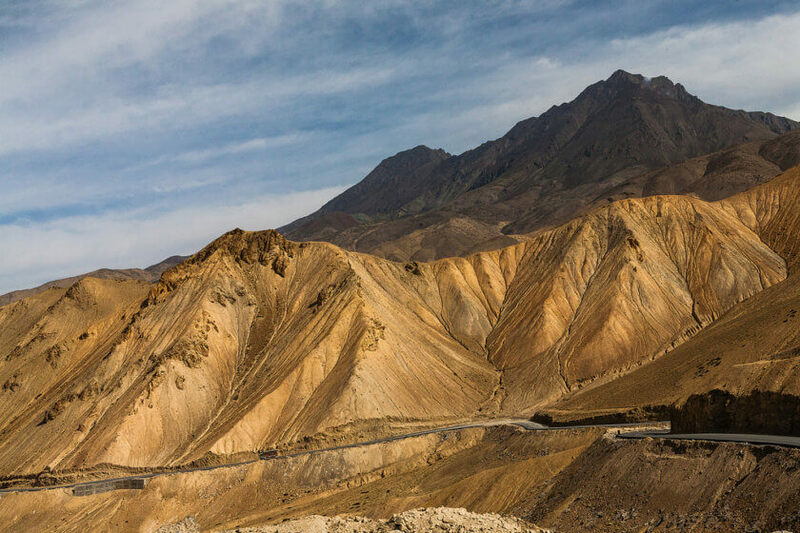 Set aside a few days to take a moderately daring trek across the Zanskar range. While it does not snow heavily in August here, the risk comes from the melting mountain snow that often causes landslides and road blocks. The Zanskar and Ladakh ranges are among the best sightseeing spots that the region has to offer, and the mountainous terrain makes for some fun by echoing the sounds of your shouts. 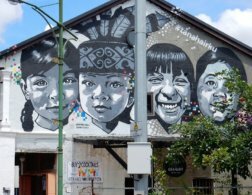 Although a bit childish, it’s nevertheless a profound experience for those who have spent the majority of their lives in cities – where the voice of the self gets lost in the milling crowds. Trekking in Ladakh is a passion for many adventurers and trained trekkers. 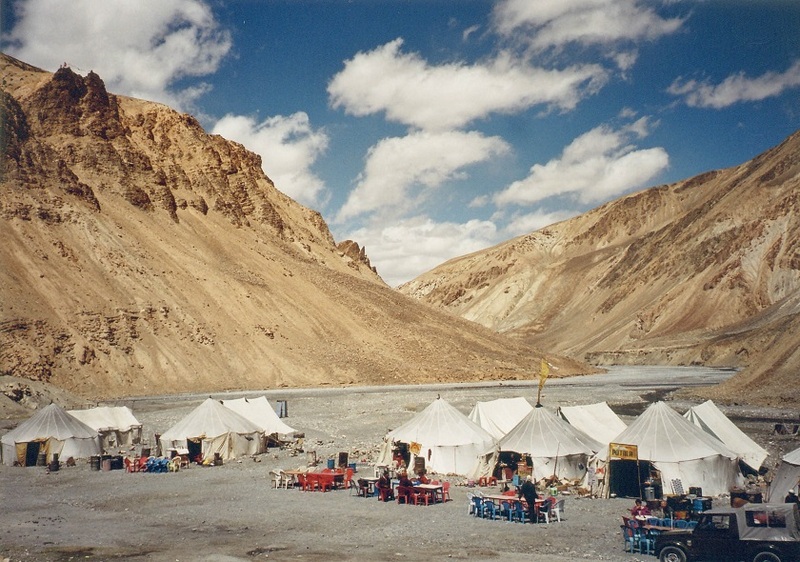 People come here from all corners of the world to head to the Leh Ladakh adventure camps that have sprouted across these challenging routes, from Patnitop to Sudh Mahadev. Some of the more daring sorts also try their hand at the paragliding options available here. When trekking, be sure to carry full trekking gear, camping equipment and footwear for adventure activities. Also make sure you take with you sufficient reserves of drinking water and heating equipment, and adequate quantities of life-saving drugs to be administered in case of altitude sickness. 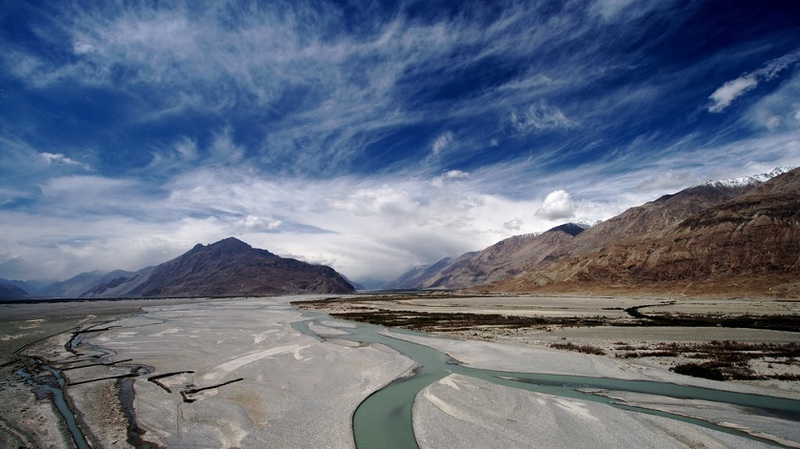 If deserts are your thing, explore the Nubra Valley. Technically a desert, the valley offers the fascinating experience of walking through sand dunes eighteen thousand feet above sea level; this is another place to bring your camera, as the landscape is stunning. A short drive from here will take you to the fourteenth century Diskit monastery, built by Changzem Tsera Zangpo. Run by the monks of the Gelupa sect, the place houses a huge drum, symbolic of Buddhist traditions – and is a great place to have quiet conversations with the self. 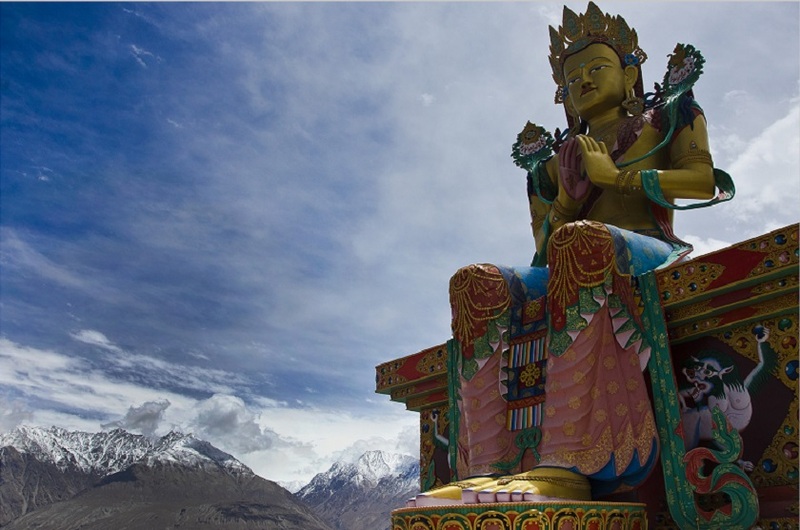 Our advice to fellow travelers is to reserve an entire day for the Nubra Valley and the Diskit monastery. Ladakh is also an awesome place to go mountain biking. Try first riding to the amazing gravity-defying attraction that local folks have named the Magnetic Hill. We witnessed what seemed like an anti-gravitational pull that acted on the unmanned vehicles of motorists that travel up the hill. It was a spectacular sight to see high school physics appear to be proven wrong! Located next to the Magnetic Hill is the Gurudwara Pathar Sahib, a place of great historic and religious significance to the Sikhs in India. Local legend has it that the founder Guru of Sikhism, Guru Nanak Dev, set foot here for meditation and it is the perfect way to finish a bike ride. Even as we took the return flight to Delhi, we savored the aerial view from the window side, and used this time to reflect on the natural beauty and spiritual bliss that we had experienced. The simplicity and wisdom of the Buddhist monks, the hospitality of the locals of Ladakh and most importantly and the unique taste of the Thukpa are memories that will stay with me forever. 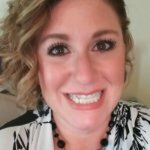 This was a guest post by Michelle Breitstein. 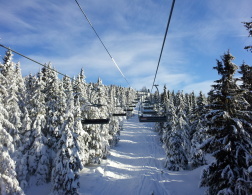 A wanderer by choice, Michelle Breitstein has an unending love for the mountains. 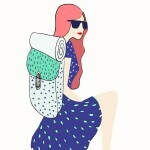 She craves experiences of all kinds, and goes wherever her wanderlust takes her. She has explored Switzerland, India, France, Austria, Nepal, Tibet and several places in her own country, the United States. Her great achievements include trekking to Everest Base Camp, Chadar Trek and the Bernese Oberland Glacier Trek. She’s also interested in mountain biking, kayaking and leading a nomadic life, where she can spare time for travel writing, adventure sports, photography, volunteer travel, and staying cooped up in a caravan, guiding a tour.